Warranties are provided for most products currently sold, so why not joint replacements? Think about it. Joint replacements are manufactured to extremely tight tolerances. They are rigorously tested both in the lab and in humans. Catastrophic failure of the components is rare. From a purely manufacturing stand point, it would seem that joint replacement components would be an ideal product on which to provide a warranty. As an orthopedic surgeon, my patients typically ask me, “How long will my knee replacement last?” This seems like a simple question on the surface, but is actually quite complicated to answer. In the past, we used to say “about 10 to 15 years.” However, that does not reflect the current state of materials and surgical techniques. Current studies show that approximately 80%-95% of knee replacements will still be functioning after 15 years. However, these survivorship studies are based on older technology and the results may be even better than that now. Ultimately, this longevity is pretty remarkable and it is reasonable to think that most modern knee replacements will last many decades. However some replacements do not last this long and require a revision (second surgery to fix a problem). The failure of a joint replacement can occur for many different reasons. These include infection, trauma, loosening (non-infectious), wearing out, or poor implant positioning. These problems could be caused by the patient, the surgeon, the implant or may be unknown. When revision surgery is necessary, it creates a very stressful time in a patient’s life. These stresses include financial hardships, loss of time at work, and can be emotionally taxing on the entire family. Additionally, this type of surgery may not have an excellent or even satisfactory result. In the United States there is only one manufacturer providing a warranty on their joint replacement product. Biomet is now promising “lifetime warranty” on their partial knee replacement. This would seem to be a step in the right direction and I applaud Biomet for their forward thinking in this arena. Is it possible that this could become the new standard from joint replacement manufactures? As with every warranty, it is always important to read the disclaimer information next to the asterisks. Let’s examine the good parts of this warranty. If a covered Oxford partial knee replacement needs to be revised, Biomet will provide the components, for free, for a second partial replacement or provide the components for the conversion to a total (full) knee replacement. According to my conversation with a Biomet representative, this warranty is applicable if a revision is needed for any reason, except for products that are past their expiration date at the time of implantation. The potential problem however, may not have anything to do with the warranty itself; rather it is how this warranty would be provided. Typically, when a consumer receives a warranty on a product this gives them a sense of protection from financial loss associated with a defect in the product. However, that may not be the case here in this situation. 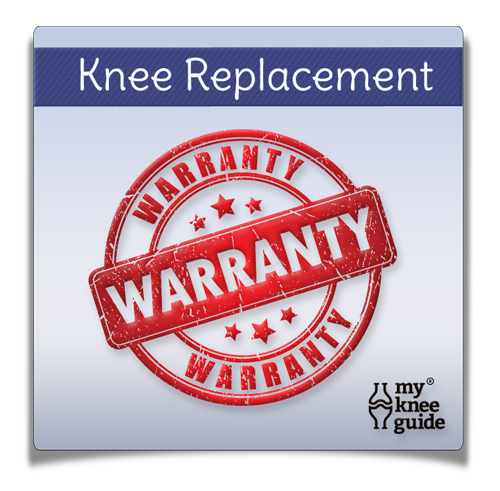 This warranty only covers the cost of the knee replacement prosthesis itself. It does not cover any hospital costs, co-pays or related expenses. This means that if a revision is necessary, the patient may still have significant financially responsibilities for the surgery and related expenses. According to the warranty, Biomet will provide the knee components for the revision surgery at no charge to the PURCHASER. In most cases, the purchaser of this equipment (prosthesis) is not the patient; rather, the purchaser is the hospital/surgery center. The hospital would essentially receive the implants for free, saving several thousands of dollars associated with the surgical procedure. There would be no requirement for the hospital to then pass this cost savings onto the patient’s insurance company. If the savings were somehow to be passed on to the insurance company, there is no requirement for the insurance company to pass this savings on to the patient. Ultimately, this type of warranty could help to lower the overall cost of healthcare (for the health care industry), but may not provide significant direct help to the patient. If this warranty were to be used, I would encourage any hospital/insurance company that would be benefiting from this warranty to make sure their patient is somehow provided that financial benefit. I believe that future warranties on joint replacement components have the potential to provide real savings and security to the patient. I hope that as more manufactures start to follow suit, they continue to find ways to implement these warranties to the benefit of our healthcare user, the patient. This article can also be found on Safepatientproject.org, presented by ConsumersUnion, the policy and action division of Consumer Reports. It has also been published on KevinMD.com. Tweet your comments about: Does Your Joint Replacement Have a Warranty?